Paradise Grills invites you to a big barbeque bash… In your own backyard! Paradise Grills specializes in customized backyard kitchens in Orlando. They offer services to make your grill system, bar system, fire features, and accessories all customized to make your backyard outdoor kitchens. All of their products are made in the USA. Paradise Grills makes high quality and high craftsmanship products that have lifetime warranties. 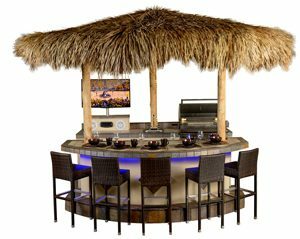 Paradise Grills has emerged as America’s, and Orlando’s, leader in outdoor grilling entertainment, as well as the largest outdoor kitchen manufacturer. They offer several unique features exclusive to Paradise Grills such as accessories. 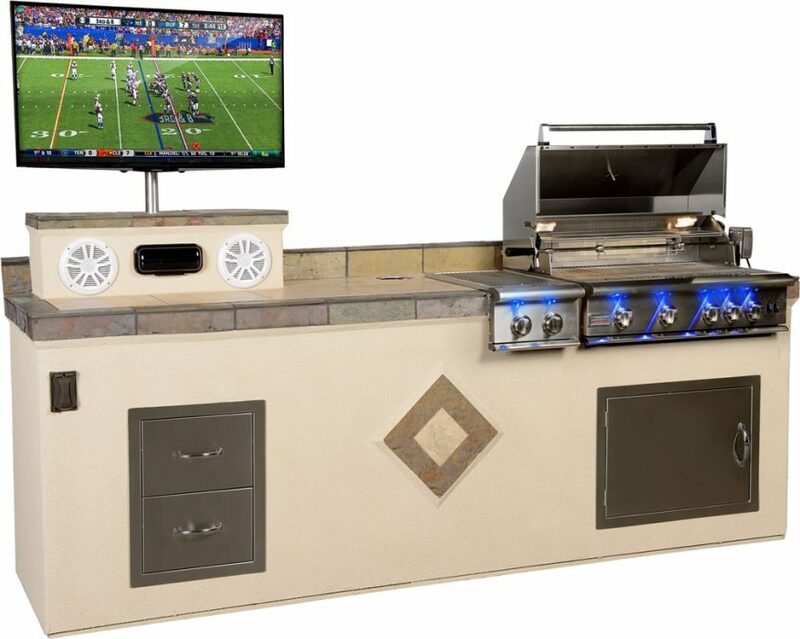 The Paradise Grill system can have entertainment accessories added based on your personal preference, such as televisions, color changing LED lights, stainless steel drawers, and a sink. They also offer grill enhancements including a sear station, a woodchip and charcoal smoker box, and a rotisserie. When you order your grill or outdoor kitchen from Paradise Grills, there are several options to choose from. Flexbuild allows you to pair any of the grills with your favorite bar system. This can also be easily done online here. You may also visit their Orlando Showroom, in order to get a feel for which pieces you would enjoy the most in your backyard. Once you have chosen your Orlando outdoor kitchen, it will be submitted to Paradise Grills, who will then get in touch with you to help set up a great time for delivery as well as make any changes you may want to make to your outdoor kitchen. Customer Service will also answer any questions you may have regarding your order and the product as well. Once delivery has been scheduled, all you have to do is wait for your beautiful outdoor kitchen to be delivered to your backyard. On the day of delivery, an installation team will come to your door and let you know they will be installing your outdoor kitchen. They will then ask where you would like it, as is customary but not necessary due to the movability of the kitchen. Once they have gotten all the necessary information, they will start the installation of your new customized outdoor kitchen! The installation team will be professional, as well as courteous to you. They will install the kitchen with care and precision. Once they have completed installation, if there is a problem, they will deal with it to the best of their ability. After you are satisfied with the installation and the outdoor kitchen, the installation team will be happy to clean up after themselves in order to allow you to start using your grill as soon as they leave! They have the strongest built welded frame for your outdoor kitchen that is guaranteed to last a lifetime. All of their grilling systems offer a Plug-N-Play electrical system. They offer and oversized footrest with their bar systems to provide you with the utmost comfort. Their Tiki Hut is also welded and waterproof to give you the Paradise feel without worrying about the warp that can take its toll on anything made of wood or other malleable material. Paradise Grills have an exclusive Flexbuild Series in order to allow you to customize and personalize your Orlando outdoor kitchen. Paradise Grills’ exclusive remote controlled LED color changing lighting will take your grilling game to the next level. Choose from soft white lights to a strobe light with multiple flashing colors. Their professional grill that features a stainless steel commercial grade grill, charcoal and wood chip smoker stations, and infrared sear station. They are America’s largest manufacturer of outdoor kitchens. Every year they produce thousands of outdoor grills, kitchens, fire pits, and fireplaces. Paradise Grills offers several fire features you can place in your backyard as well. The first feature they offer is the Paradise Firepit . 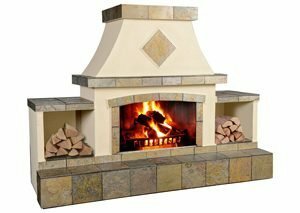 The fire pit has a stucco base with a 12”x12” Tile/Slate surface, depending on your choice. It comes with Diamond Accents and Gas burning Lava Rocks. You can also upgrade it with a granite surface top (with your choice of colors) and an LED lighting system. It is a great addition to your backyard entertainment area, and the red lava ricks creates a great ambiance to enjoy in any climate year round. The total measurement is 50”x50”. Your next choice for fire pits is the Paradise Firepit XL . It has all the same amenities as the Paradise Firepit, with more space in order to entertain more of your friends or family. This fire pit measures at 43”x72”. The next fire feature given by Paradise Grills is the Paradise Fireplace. The fireplace offers a stucco base with a tile/slate surface top. You also have your choice of gas or wood burning. Optional upgrades include a granite surface top and an LED lighting system. This Paradise Fireplace combined with a Paradise Grilling System will complete your luxurious outdoor entertainment space. Firebox is designed to accommodate gas logs or wood burning, depending on your personal preference. The measurement of this fireplace is 39”x67’Wx81”H. Your next option is the Paradise Fire XL. It has all the same features of the Paradise Fireplace but also includes built in wood storage boxes, and add LED remote lighting to complete this luxurious outdoor Fire Feature. The fireplace measures in at 39”x108”Wx81”H. Many customers have stopped in at Paradise Grills to share their great experiences. Steve S. in Virginia has a particularly happy end result as he says, “[The] Entire company went above and beyond to get the unit delivered even when I objected because of the difficulty in getting to the deck. I could not ask for better service and if you want a recommendation, I will be pleased to provide one.” Paradise Grills is also happy to deliver outside of the Orlando area, as they have many customers in the northeast region as well. When you are ready to shop for your Outdoor Kitchen in Orlando, take a look at Paradise Grills. Their customer service is more than ready to help and their whole staff is professional and courteous. Get in touch with them here or feel free to call them at (321)270-8472. You can also email them at sales@myparadisegrill.com.